Fantastic free fiction! And a new review. Cheaper than a speeding bullet! More portable than a locomotive! Able to enter your computer at a single bound! Do you like superheroes? Do you like super hot guys? 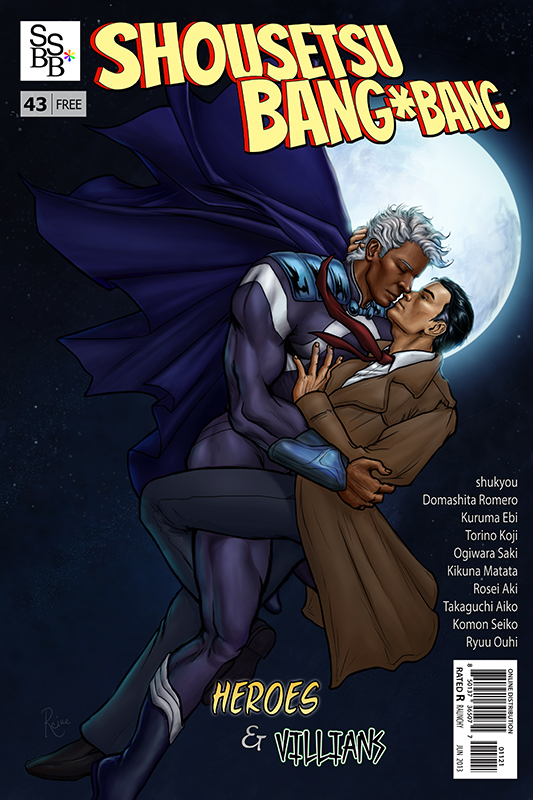 Then the latest edition of Shousetsu Bang*Bang, volume 43, is for you! Once again, Shousetsu Bang*Bang sets itself apart as a purveyor of fine, diverse, and high-quality fiction, available to you at no cost! Except for your comments, and I hope you’ll repay the author’s time if you enjoy their story. In other happy news, Serena Yates with Rainbow Book Reviews has given A Cut Above the Rest a four-star review. “With characters as colorful as their productions, and the fierce competition and passion between them, this book is a true delight for all the senses.” And if I’m not mistaken, Joyfully Jay will be next… I’ll keep you posted! Check out the great things Serena had to say. Surfeit for the Senses will be making its debut on the menu July 24th, so I hope you’ve already caught up with the latest in the Appetite series, The Competitive Edge! Coming next: an entry on the importance of assimilating and working with concrit.